As we're more than halfway through January I've been reflecting on the goals I set myself at the beginning of the month. I'm so glad I chose less than ten goals because my progress has been slow. Going public should hopefully spur me into action. There have been some stirrings of activity though. 1. Set up my home office space in our bedroom. Yes, almost - I am now using my new desk, lamp and chair and finding that it is helping me to focus on my work. 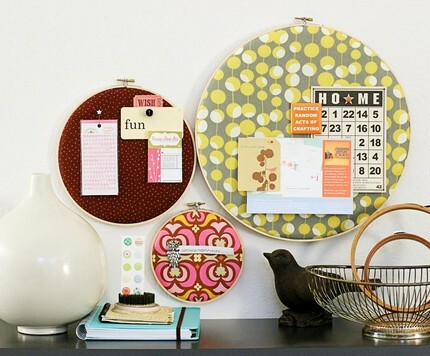 My wall art project is coming along and I am going to make a hoop pinboard inspired by the image above. Snow stopped play yesterday though as it was too hazardous to go out to the shops to buy the materials. 2. Spend less on groceries and keep up spending diary on a daily basis. Yes/No - I still haven't set pen to paper and used my spending diary, although my spending is under reasonable control. I would like to spend less on groceries this year and I need to focus on this more. 3. Buy a good pair of evening/smart day-wear black trousers. Yes, almost - I had a Boden gift voucher (yah) for Christmas and have ordered some black trousers but there is a stock shortage so delivery is delayed. 4. Cook at least one recipe from new cookbook The Little Paris Kitchen. No hubs has been cooking like a pro this month and I have happily let him. Hopefully, I will produce something from this book by the end of the month. 5. Declutter wardrobe post Project 333. Donate excess to charity. Yes the bedroom and clothes declutter is coming along and I have already donated quite a lot to charity this month. 6. Book a music/festival/comedy event for the summer. No action here. 7. Plan mine and youngest son's birthdays (February). Still undecided on this. Apparently hubs has organised an experience for me for my birthday so that means no. 6 could be ticked off. Love your blog :)I'm working on number 2!! I have just booked a concert in May, a gift from my daughter......and talked to my builder about creating a sort of understands office in my bedroom. I was blog hopping and found your blog. Looks like fun. I must think about goal setting. Seriously! I love that home office idea. Whenever I settle down, I may co-opt it.